Arriving as the beloved science fiction franchise approaches its 50th anniversary, Star Trek Beyond is the third (with a fourth already confirmed) cinematic instalment set in the rebooted ‘Kelvin Timeline’ featured in J.J. Abrams’ Star Trek (2009) and sequel Star Trek Into Darkness (2013). Directed by Fast & Furious veteran Justin Lin, Beyond proves a worthy continuation of this new series of Star Trek films that’s crowd pleasing fun if not as wholly cerebral as some of the franchise’s highpoints. Whilst Abrams is arguably the better filmmaker, Lin is a credible successor who does a commendable job of crafting a commercially viable summer blockbuster, his affection for the franchise and its characters clear as he deftly balances an eclectic ensemble with large scale action and jaw dropping visuals. Although this is a Star Trek for the era of serviceable billion dollar blockbusters, Beyond offers something a little more with a script (by Simon Pegg and Doug Jung) that delves into themes of unity and the strengths found in diversity, reflecting on the social concerns of today. Via the two J.J. Abrams outings, audiences have grown to love the characters of Kirk, Spock, McCoy et al thanks to a wonderful cast, melding nuances of their own personalities with the legacies of these established characters. Thankfully that continues here and we get some great character moments amongst the spectacle and social commentary where everyone (albeit some more than others) gets an opportunity to shine. Zoe Saldana, John Cho and the late Anton Yelchin (as Enterprise crewmembers Uhura, Sulu and Chekov respectively) all feature in the action and have relevance in the story (Simon Pegg’s Scotty is also served better beyond being mere comic foil). Idris Elba makes an imposing villain with physicality and gravitas, although the character of Krall could have warranted further exploration he delivers a fair measure of menace and threat. Fellow guest star Sofia Boutella (Kingsman: The Secret Service) also provides a memorable and enjoyable turn as Jaylah, the alien ‘badass’ that a stranded Kirk and company enlist for help against Elba’s Krall. Once again, though it’s the three main stars that compel the most with numerous standout moments for Chris Pine, Zachary Quinto and Karl Urban. Through Pine we get a universe weary Kirk, with Quinto a contemplative Spock and Urban a McCoy who’s irascible as ever and provides both humour and the supportive conscience Kirk and Spock need as they face their respective emotional dilemmas. Against the backdrop of story and character, Justin Lin brings his Fast & Furious credentials to the fore during the action of Star Trek Beyond with big budget CGI and explosive pyrotechnics marrying to produce some jaw dropping spectacle (most significantly the decimation of the poor old Enterprise, as already depicted in the film’s pre-release trailers). It’s a little frantic at times, but no different from what you would experience in any modern blockbuster. In addition to all of this, there’s a plethora of references, tributes and respectful call backs to the history and legacy of Star Trek that all in all make for a pleasing and fitting celebration of one of pop culture’s most beloved and enduring franchises that will most definitely continue to go boldly. The bottom line: Star Trek Beyond is an enjoyable and fun blockbuster that has something to offer both fans and casual viewers alike and proves a fitting tribute to the legacy of the franchise on the eve of its 50th anniversary. Star Trek Beyond is in cinemas now. 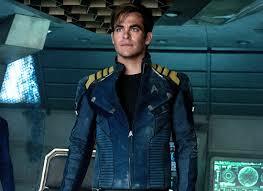 Captain James T. Kirk (Chris Pine) prepares to lead the fight in Paramount Pictures’ ‘Star Trek Beyond’.